The Vision Urbanetic can carry people or goods on demand. Self-driving vehicles are useful for hauling both people and cargo, but you can usually only prioritize one of those tasks unless you can afford to buy separate vehicles. Mercedes-Benz might have a solution to the problem: build a machine that can change its role on demand. 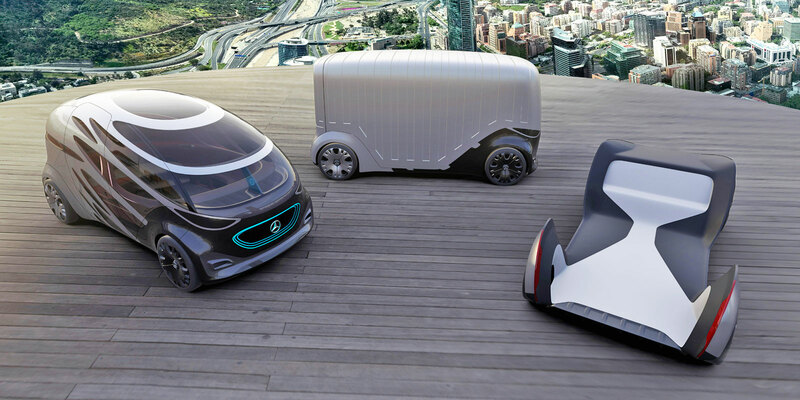 Its Vision Urbanetic concept van uses a modular body system to switch between people-carrying and cargo duties, with an electric-powered platform underneath. If you need a ridesharing service or shuttle bus, a passenger module can take up to 12 people while providing a dramatic view of the road. If you need to ferry goods across town, however, the cargo module fits as many as 10 European-sized pallets inside a boxy, no-nonsense frame. A company or public agency could serve two sets of customers without having to buy separate fleets for each. And you wouldn't need to put all the modules in the same place -- the base vehicle can travel without any module attached. Appropriately, connected car technology plays an important role in the concept. An IT framework would monitor demand in real time and determine when to start swapping modules. If there's a rush of package deliveries in the morning, the Vision Urbanetic system could run more cargo-oriented vans to ensure that people get their goods on time. If a concert just finished, however, it could switch to passenger modules to make sure people can leave the venue. Mercedes didn't say how body swapping works, but it noted that you can exchange tops either automatically or manually, and that the automated process takes "a few minutes." With a passenger module, displays and lights around the vehicle let others know that it's aware of their presence. There are a number of unanswered questions. How likely are you to see a practical product once Mercedes is confident its autonomous driving technology is ready? Would it be affordable for operations, or would it mostly be reserved for larger companies and governments? The potential uses could be vast if this does evolve beyond the concept stage, though. A ridesharing company could make the most of its investment by hauling cargo in quiet hours, while airports could shuttle passengers or their luggage depending on whatever is most pressing. In effect, it could make self-driving vehicles realistic in situations where they would sometimes go to waste.